Home / monthy thoughts / August, where did the summer go? August, where did the summer go? Not a bad view from the caravan while washing up! Doesn’t seem a month since I last did my end of month review and so much has happen during this time. Spent a lovely week on holiday down in one of my favourite parts of the county, Dorset. With its rolling green hills, blue sky coupled with Dorset Apple cake, mmm apple cake and clotted cream, stuff dreams are made of! It also have beautiful cliffs full of fossils there. Finding fossils is a great part time love of mine, would love to spend so much more time trying to find these treasures from millions of years ago, but I sadly can’t. It does however mean anytime I spend doing it, i just make the best of it. I was so pleased that my middle girl found her first one and she loved it and soon followed it up with a second. The wonderful thing is, I use the fossils I have found into my alpine pots, it makes the pots feel even more personal and remind me of times away in the summer, that’s the delight of gardens and plants isn’t, you can special plants or features that can take you away to special place and memory every time. August this year seemed to follow the pattern of a few years ago, once the final bell of the school term rang, the weather also followed suit, the bright sunny warm days that we enjoyed so much before the end of tine school year, finished at the same time and turned into the dull mix of cloud, rain, thunderstorms and the odd sunny days for the rest of August. After the dryness and heat of July, it was a little bit of a welcomed break, (mainly from watering!) and seeing the very dry grass slowly coming back to life once more. Biggest highlight of the month, was to get rid of my large boot! And to start to get around a lot more, even more exciting to be able to drive once more! So nice to have that freedom back, to be able to get to where I want to go without relying on lifts and to be driven there. As soon as the boot came off, it was back to work, not proper, but back to doing things like catching up with pruning the rambling roses, trimming up the hedges and pruning the shrubs that haven’t been done in my absence. So lovely to get back to the gardens and gardening once more, seeing how they have grown and developed the during my time away. Even nicer to finish off the planting on a few sites! And beech dividing hedges trimmed! Didn’t manage to walk around as many gardens as I would of liked too, SirHarold Hillier gardens and the excellent gardens at Chawton House, a beautiful estate near Alton, to attend a plant fair there, was pretty well behaved for me and didn’t buy too many plants…..
Also managed to attend the Shoot Maintenance Matters meeting at Capel Manor. Spend a little bit of time walking around the wonderful parks there and enjoying the morning before making a video for Shoot and attending the excellent meeting! Already expressed my views in another blog so won’t bore you with them again but it was great to spend time with like minded people, who are looking to get the best from their designs. Great to know so knowledgeable gardeners are highly sort after! Looking forward to next month and it’s going to be a busy one, trips planned both to GLEE in Birmingham, following week, to the landscape show and hoping to add a trip with GMA to Kent as well, fingers cross I can make it! The talks are also making a come back in September, with me in attendance from East Sussex to Dorset! Work will hopefully busy with a new project starting in the middle of the month, still a bit of hedge cutting to finish off, a couple of wild flower meadows to trim, spring bulbs to order, bare root rose orders to place to make sure I can get the ones I want. Looking forward to getting truly stuck in this month! Hey Thomas! In that foot photo, it still looks like the one leg is bigger than the other. Have they yet moved closer together – in the direction of your former foot/ankle size – as mine did after a similar accident? I suspect that Summer has switched hemispheres and is hopefully on its way over here to Australia! We are anticipating her arrival, though will thoroughly enjoy Spring first! 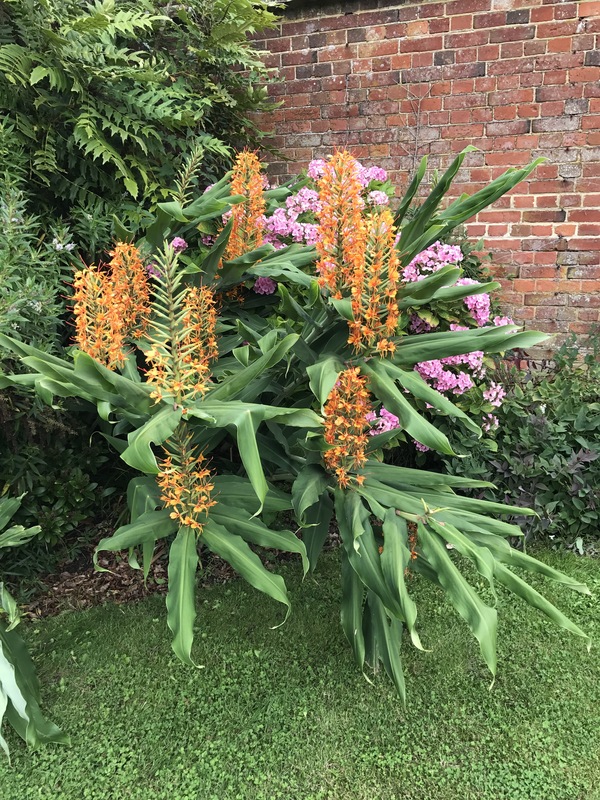 Loved your photo of the Hedychium and it’s a great idea planting your fossils in your alpine pots. Glad to hear that you are a bit more mobile! I hope so 😀 although I am hoping for a bit of a warm spell during this month, would be lovely to have a hot few days, it must be nearly your spring now is it? That’s my favourite time, seeing everything come to life after a bare winter. Thank you 😊 it’s works really well, sadly the local garden centre had some more pots reduced yesterday so have a few more to build now 😀 thank you, it makes life so much easier and great to be out earning once more! How’s life treating you? It is! The maple leaves are just starting to unfurl and the crab apple blossoms and viburnum heads open. It is my favourite time too and can never come fast enough! I love seeing the garden come to life again after the long Winter! It is such an exciting time!